Learn how our sugary sweet apple came to bee! 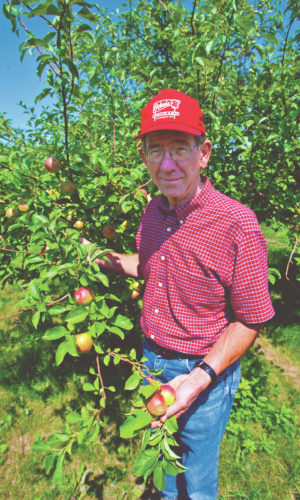 Decades ago, a Minnesota orchardist named Chuck Nystrom filled his orchard with apple seeds of every variety he could imagine. After lots of patience, time, and plenty of water and sunlight, each of these seeds grew into large, healthy apple trees. Some trees produced Gala apples, some trees produced Honeycrisp apples, some trees produced Red Delicious apples, and so on! But before the fruit can grow, a critical spring time task is carried out by the smallest of helpers — the honey bee! Apple trees bud beautiful pink and white apple blossoms, but in order for each flower to become a future apple, it must be pollinated by a honey bee who flies from flower to flower collecting nectar to turn into honey. Most apples need pollen from a different variety of apple to set fruit. This process is called “cross-pollination” and orchardists work hard to ensure compatible varieties are planted near one another so the apples will be juicy and sweet. One sunny spring day, a honey bee was buzzing throughout Mr. Nystrom’s orchard, collecting nectar and cross-pollinating apple blossoms along the way. While buzzing to-and-fro, the honey bee stopped at a Honeycrisp tree and collected nectar and pollen from one of its blossoms. As the day went on, this little honey bee passed that Honeycrisp apple pollen onto other lovely blossoms. Little did this bee know its cross-pollination between a Honeycrisp and an unknown variety had just resulted in the beloved SugarBee®™ apple we know and enjoy today! Months later, when apples of every shape and color began to grow, Mr. Nystrom discovered this all new variety of apple in his orchard! It was large and round, with bright red and yellow coloring. He took a bite…. “Yum!” The apple had a crispy firm texture and was unbelievably sugar-sweet. He was thrilled and spread word far and wide of a new delicious apple variety, which he then called B-51, commenting again and again on its sweet and crunchy nature. Over a thousand miles away in the elevated orchards of Washington state, word of this sweet new apple got to growers at Chelan Fruit Cooperative and Gebbers Farms. After speaking with their marketing company, Chelan Fresh, everyone agreed “we must have this apple!” Thanks to Central Washington’s warm summer days, cool evening breezes and Yakima County’s fertile valleys, Chelan Fresh orchards offer the ideal growing conditions for the apple. In 2013 Mr. Nystrom agreed they were the perfect candidates to grow B-51 (later patented as CN-121). 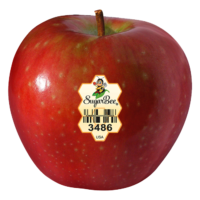 Because this apple formed from the cross-pollination of a honey bee and has a sugary-sweet flavor, the team at Chelan Fresh gave B-51 an official (and very fitting) name: SugarBee®! Look for SugarBee® in grocery stores near you.